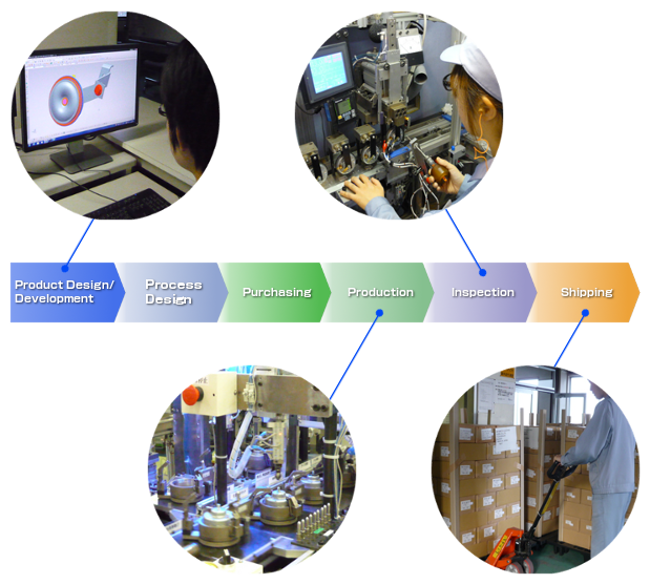 Miyamoto's in-house development capabilities ensure the production of highly-reliable products and fast response to various customer needs. We carry out the entire process from design development through parts procurement, production, shipping and quality assurance. Our capabilities include not only production but product development, designing of production lines and manufacturing of production facilities. For production facilities among others, we design and process machinery and even manage electrical control, which allows us to provide great flexibility for delivery date, cost and troubleshooting. We are also fully equipped with experimental facilities in order to respond precisely and immediately to testing and quality verification requirements.